When you put an Ajax Calendar Extender inside of a GridView you will see the calendar without any styling on it meaning the calendar will show only the dates overlapping with other items on your form. Sometimes some dates might even be missing. See the sample appearances below. This happens because the style sheets are not loaded at the correct time due to a bug in toolkit, there are several ways to fix this. One is to add another calendar extender outside of the update panel and keep it hidden. Another is to disable partial rendering in the script manager. But this will slow down your site reducing the benefits gained from AJAX. My chosen method is to add the styles manually to the style sheet. To move forward this way simply copy the following styles which are used by the calendar extender to your style sheet. Note that the above CSS uses the “arrow-left.gif” and “arrow-right.gif” for the previous and next buttons. If you want, you can use any other image which suits you. In case you need the originals they are below. To correctly show the previous and next buttons you need to place these images on to the “Images” folder under your project. If the folder is different in your project please change the image paths in the above CSS. After doing all this remember to link the style sheet to your web page. If you have done everything correctly your calendar will be shown properly while residing inside of the grid. You can create nice looking expandable regions using just HTML and some Java scripting. This is specially useful if you are to create a site without any major programming languages. Today I thought to share an expandable region that I created to give you an idea to get it done. When the code works it will look like the following. You should be excited by now, to get it working you need the following code inserted into a body section of a HTML file. Please note I have added the CSS also in to the page body, but if you have a separate CSS file please separate the CSS . // Retrieving the first child item. // Getting the correct child item with inner HTML text. // Toggling the + or – according to the state after click. // Toggling the display image after click. // Get the sub item to toggle visibility. // Toggle visibility of the sub item. // Displaying everything if item could not be found. Remember to correct the image URLs, otherwise they will go missing. I need to thank M. C. Matti for his great article which gave me this idea. Also you can use this method to create expandable regions in other sites which use different technologies. For example if you need to add this to a SharePoint site, just use a Content Editor web part and paste the code using Source Editor in web part properties. Today I thought to share with you, how to create menus using HTML only. These menus will be very useful if you need to create web sites using only HTML. 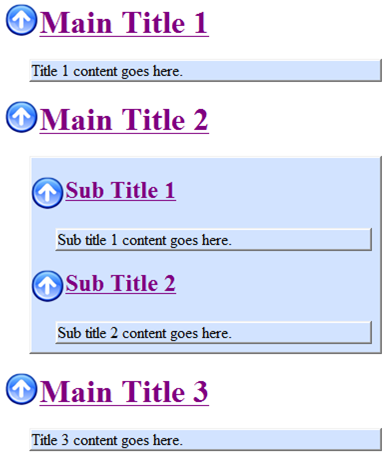 Above menu is created using basic unordered list (UL), list items (LI), links and some CSS. Below is the HTML code for the menu. In the code I have created the full menu using HTML lists and used CSS to format the list to work as a menu. Below is the CSS that you need to make the above HTML work as a menu. Do not forget to import the CSS into the HTML page by using a link as shown below. I used the following images as the background images of the links. I think the code is not that complex, so hope this helps, let me know if you need any help on this, I will try to help you out. If you had lengthier menus in you ASP.Net application and had used report viewer control you may have faced the problem of report and menu overlapping when ever the report is loaded with data. 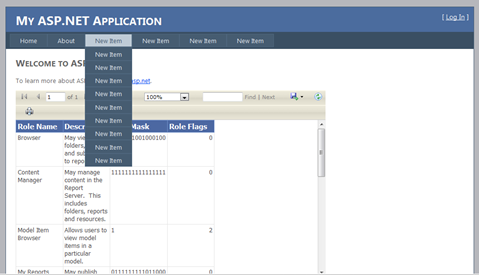 For example in my sample application it appeared as below. To correct this behavior you need to set the z-index for menu and report viewer using CSS class property. For this I have used the following CSS classes in the Style.CSS. To apply the CSS use a code similar to following. 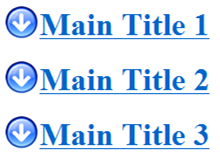 Appling CSS Class to menu in master page. Appling CSS Class to report viewer. <rsweb:ReportViewer ID="ReportViewer1" runat="server" Font-Names="Verdana" CssClass="report"
This will correct the overlapping issue as seen below. When designing web sites it always looks nicer if you could round the sharp corners, for example see below, what looks nicer to you? My feeling is the rounded corners are better looking than the normal one. But the problem is, there is no easy way to create this. You need some Cascade Style Sheet (CSS) knowledge to do this. The easy way to round the required corners is to use the following code. The above code is self explanatory so I didn’t put any comments there. To make it work you need the following 4 images placed on your Images directory. If I am to explain the code, the corners are curved by using 4 different DIVs and placing the above images on them. For example the following DIVs does the trick. The content you need to put in the middle should be wrapped by these DIVs. In the above code I used another DIV for placing content having the ID Content. Inserting curved images to the corners of the DIVs are done by using a style per DIV. The CSS classes which are used to change these DIVs are as of below. The filling of the required area is done by assiging a color at the background tag in CornerTopLeft style which will be applied to CornerTopLeft DIV. Note the last div#Content which was placed to style the Content DIV making the contents placed centered so the final output will be nicer.